DJI remains the forefront in providing the best platform in multi-rotor AP applications. 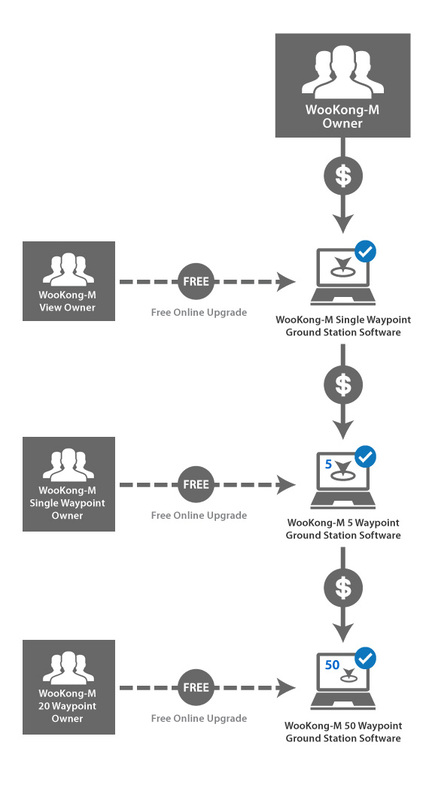 Our battle-tested single waypoint system is now a standard feature with every WooKong-M purchase (excluding data link). Customers with “View” and data link purchases can upgrade to single waypoint via firmware upgrade; while single waypoint customers will enjoy the new 5-waypoint; full waypoint is now increased from 20 to 50, requiring a simple firmware upgrade. Please donwload WKM assistant software version 1.26, user manual version 2.7 and upgrade to newest firmware version 5.08 online, please then reinstall ground station software via product CD. For detailed upgrade process, please click here. If you have any questions, please contact your local dealer or DJI head quarters, thanks! Notices：Make sure reconfigure all parameters after upgrading firmware.